PS: Should be the same for almost all boys!! 8 Responses to Vivek’s Cloth Washing Algorithm. Hey blue moon occurs every two or three years [wiki]. So are you saying you wash clothes atleast once in 3 years?? !!! I’ve got washing machine in my building and my washing cycle repeats in 2 weeks … and I am perhaps too clean among boys! :). Do yo know that I work on optimizations now!. 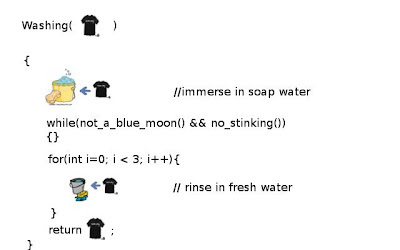 It is a different case with washing machines..
good algo… but what is the pre-condition for Washing?